What's Happenin' at Xerox - 2018 Analyst Meeting | Industry Analysts, Inc.
By Andy Slawetsky – Xerox held an analyst meeting at their office in NYC on Oct. 10. It has been about 18 months since their last briefing and while many of the faces are familiar, others were noticeably missing. Xerox’s new president and COO Steve Bandrowczak, who took the position back in June, greeted us at dinner the night before the event and you can hear most of Steve’s discussion with us in the video below. This was our first interaction with Steve and he said a lot of the things we were hoping to hear. 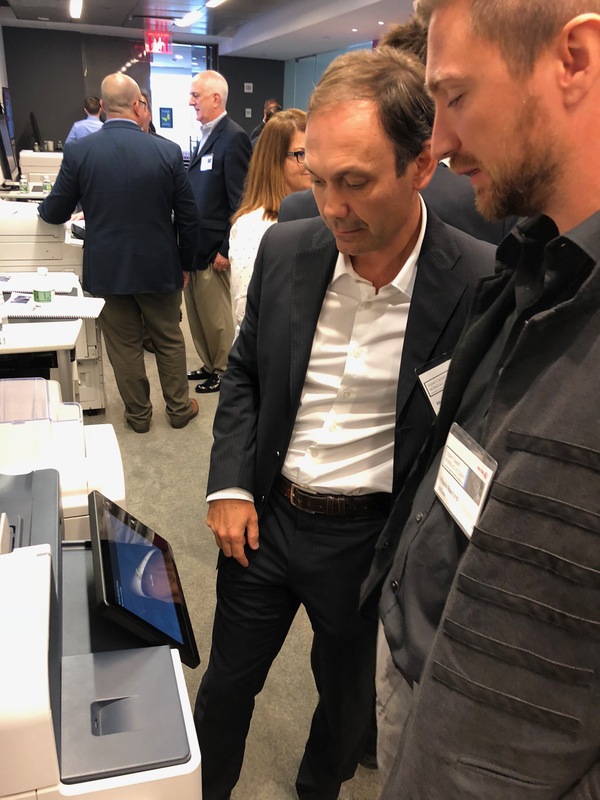 The next day started bright and early at the Xerox executive briefing center and the event was titled Today’s Smart Workplace Assistant Analyst Briefing. VP Bertrand Cerisier officially welcomed us before handing things over to SVP Tracey Koziol, who then got into the first presentation, discussing the acceleration of the workplace and digitization with Xerox technology and services. This was a lead-in to what would be a long day full of presentations on ConnectKey and the innovations and evolution of Xerox’s strategy to transform MFPs into workplace assistants through the development and use of software and apps. “Not ‘just’ printers but genuine workplace assistants,” said one slide. ConnectKey can help improve the user experience by integrating tools such as the smart phone into the network environment, providing secure and simplified access to cloud services like Dropbox, Google Drive and OneDrive, etc. After some discussion on security, the presentation turned to Education, where Xerox says they’re “enabling a smarter workplace for education” by helping customers better manage print costs, create and grade tests, proofread course work and share learning materials. We’d see hands on demonstrations of this later. A major theme throughout the day was Find it, Map it, App it, which is Xerox’s program to “transform a printing salesforce into productivity advisors.” The program is a Workplace Assistant educational program for their reps, partners and resellers and it provides workflow mapping tools, a solutions playbook and video case studies among other things. We would see a more granular presentation on this topic towards the end of the day. Over the next few months, Xerox will be busy as they expand their Workplace Assistant capabilities, adding new solutions and Apps. They will also continue to roll out workflow automation tools and solutions and focus their efforts on educating their sales force to become “trusted advisors able to assist our customers to design the most efficient work environment.” Lastly, Xerox said they will continue building and maintaining a secure document management ecosystem capable of detecting, protecting and adjusting to threats. A security undertone we would hear throughout the day. After the opening session and a short break, we were split into groups and taken to the different presentation areas. My first one started with VP Elizabeth Fox discussing Xerox managed print services among other things. Elizabeth opened with a discussion on current opportunities, citing the US Federal Government and their security challenges as well as the estimated $1.4 billion knowledge worker printing costs. Next we were taken to another presentation given by Sarah Jones and Mark Boyd on the Workplace Assistant. Sarah and Mark gave us a more hands on demonstration of scanning and routing and how their software can take steps out of annoying labor intensive jobs such organizing expenses, which they have streamlined through a ConnectKey app. One ConnectKey app that I thought was pretty interesting was the scanning and digitizing of documents into audio files so that users can listen to their scanned documents rather than read them. That’s an app I’d use. We then saw a few other scanning/capture examples before it was time to move on to the next presentation. Next came a presentation on Xerox and the Education market, where we saw demonstrations of the Workplace Assistant apps designed for schools. Specifically, we saw how school records could be updated through scanning technology integrated into the MFP user interface. The apps tie into major solutions in education such as those from Skyward, Follett and PowerShool, allowing Xerox to tie into current workflow rather than having to sell completely new ones to customers. We saw other examples of the devices being used for grading tests, emailing records and analyzing reports right there at the device, or back at the desk once the documents have been scanned. Xerox is doing a nice job on making the MFP something more than just a printer to Education customers. Towards the end of the Education demonstrations, we saw something I thought was truly innovative. The Xerox Printt App is a free print program for colleges and universities where students are given free print in exchange for ads that are placed on their printed pages. The print is funded by the ads and could become a profit center for the school. And, the student gets free print. Everyone wins. It’s brilliant! My final session was the Find it, Map it, App it presentation where we took a deeper dive into the Workplace Assistant Training, Xerox’s global face-to-face training program. This was introduced at our last briefing about 18 months ago. Today, it’s being used in 87 countries and is a “Catalog full of appiness,” according to Peter Munday. Mike Feldman stopped in about this time and spoke to us for a bit before sliding off to a presentation area where he spent some time with Xerox dealer/agent Josh Justice of JustTech in the DC area (and beyond). It seemed like a good time to get another What’s Happenin’ hat photo. Next we sat through a panel of several Xerox resellers, including Josh, Samer Nasreddine, a concessionaire from Document Store of France and Alberto Raymond of EtiQube in Milan, along with Michael Leland of McAfee. Panelists discussed apps they’ve developed and the opportunities that are out there. This is one of the great differentiators between Xerox and their competitors; the ability for their channel to develop, distribute and profit from the development and proliferation of apps is a fantastic idea for so many reasons. I’ve known Josh for several years now, meeting him at a briefing like this a long time ago. This is the third or fourth time Xerox has put Josh in front of us to tell us his story. I remember him saying back when we first met that he was developing apps to solve local needs and requirements of his customers. The apps he created made the hardware stickier and once they were built, Josh put them into the Xerox ecosystem and made them available to his peers. Flash forward to four years later and now JustTech is making $35,000 per month on app licensing fees and charges. That cash is being reinvested into the company, helping them expand into other markets, such as WV where they just acquired another company last month. The app money is funding their growth and it’s an opportunity for dealers and partners that Xerox offers that others don’t. At least, not like this. The sessions ended with an interesting presentation from Lawrence Lee, VP at PARC. Lawrence works with incubation and strategy and he spent some time updating us on some of the technology they’re working with. The day finished up with one on one conversations (did I mention this was a long day?). My one on one was with President Pete Peterson and Brian Bissett of the MFP Report. Apparently one on one’s can have more than two people. It was a nice chat that could have gone on considerably longer than the 30 minutes we had to spend with Pete as Brian and I took turns peppering Pete with questions. Pete was brand new at the last briefing in 2017. Now, he’s one of the more tenured people on the senior staff. Indeed, you couldn’t help but notice the faces that weren’t here this year. Jeff is obviously gone after a highly visible battle with the board. Also gone are CMO Toni Clayton-Hine, CCO Kevin Warren, VP Leah Quesada and others, including GIS’ Dan Cooper. Xerox is undergoing a transformation and while many executives have moved on, there are plenty around that we have known for years, like Elizabeth, Tracey, Terry, Bertrand and more. Despite the ugly press earlier this year, Pete told us things are going really well for Xerox lately. Shipments are way up in the last quarter or two and things seem to be moving in the right direction. I’ve heard this from several people I know at Xerox – the changes may be a bit painful but they like and have faith in the new leadership. It was good to sit down with Xerox to find out What’s Happenin’ and I appreciate Xerox inviting me to this event. There’s still a lot under the hood at Xerox and they aim to lead, not just in terms of printing, but with respect to running the office. There are still a lot of questions with Xerox, some of which Steve answered in the video. What’s going to happen with Fujifilm and Fuji Xerox is still the biggest issue that needs to be resolved. I’ve heard unsubstantiated rumors that they’re talking and I’m guessing they will work it out. Despite the ugly fiasco of the last 12 months, they both need each other and are perfectly suited as partners. If they can’t work it out, it will be incredibly disruptive to both companies. Xerox has had a pretty bumpy road since their last briefing, but it seems as though it’s business as usual once you get below that top layer. The ConnectKey app program continues to be a significant part of their strategy for the office and it ties into verticals, horizontals and can be used by customers large and small. Everyone has a smart phone and everyone uses it a little differently. That’s what Xerox envisions for their MFPs. It was an informative briefing and I’m excited to watch Xerox’s progress moving forward. They’re still a leader in this industry. This entry was posted in Xerox and tagged xerox by andyslawetsky. Bookmark the permalink.